Eileen Hull is an artist, author, and adventurer who grew up in a large family where there was always an art project in the works. 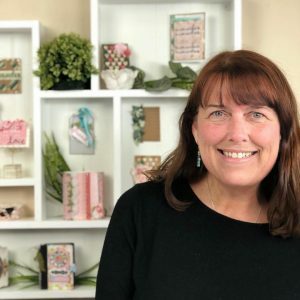 She has applied her creative thinking to all sorts of life and career events – from adjusting to thirteen military moves and raising four children to developing product lines for craft manufacturers including Sizzix, Clearsnap, Therm O Web and Emerald Creek Craft Supplies. In 2013, Eileen purchased a vintage trailer on eBay and outfitted it as a mobile studio. Since then she has been traveling across the US and Canada on the Paper Trail, teaching classes in stores, retreats and at events, and educating customers on how to use her branded products. She has logged over 59,000 miles in the past six years, has visited over thirty-five states, taught in numerous stores and has enjoyed (almost) every minute of it. Join Eileen at Stamp and Scrapbook Expo in person or online! Join Eileen Hull at the Show! Learn tips and techniques using Sizzix ScoreBoards dies from the die designer herself! This handy little book, created with Eileen’s newest ScoreBoards Notebook die, can be used in so many ways. In class, we will explore new ways to use embossing powder and Blends inks. You will customize the book to your colors and style and add your favorite touches. You will create the book cover from recycled materials and learn how to make your own signatures to go inside the book and attach them. You will leave with a finished book measuring 5 x 3 1/2 x 1″. Be sure to bring your camera because there will be lots of amazing samples showing inspirational ways to use this die! What products will be highlighted: Sizzix dies, Therm O Web adhesives, Clearsnap Blends inks, and Emerald Creek Embossing Powder. What will I learn or complete: A completed junk journal with two signatures measuring 5 x 3 1/2 x 1″. What do I need to bring to class: Paper trimmer, scissors, metal ruler, nonstick mat, pencil, and a water brush. What special supplies are needed to finish this project at home: Blends inks. What techniques will I learn or use: You will learn how to die cut a Sizzix Notebook, how to emboss on corrugated cardboard, and how to emboss patterns on a butterfly die cut. It’s so easy to create your own Wrapped Journal for your art, travel, photos, planning, special occasions, and more. In this class, you will learn to doodle without fear using dies as a base. (No doodling skills are required!) 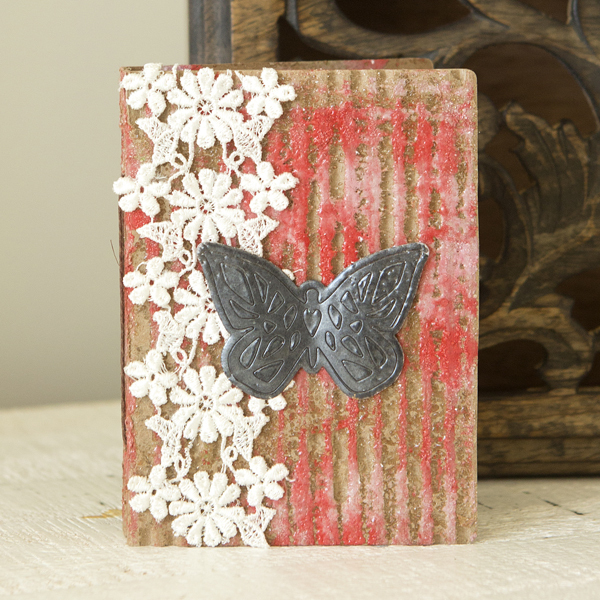 You will learn how to transfer the design to the journal, add ink, and color with Eileen’s Blends ink from Clearsnap. You will also learn how to string the journal and make inserts to go inside. 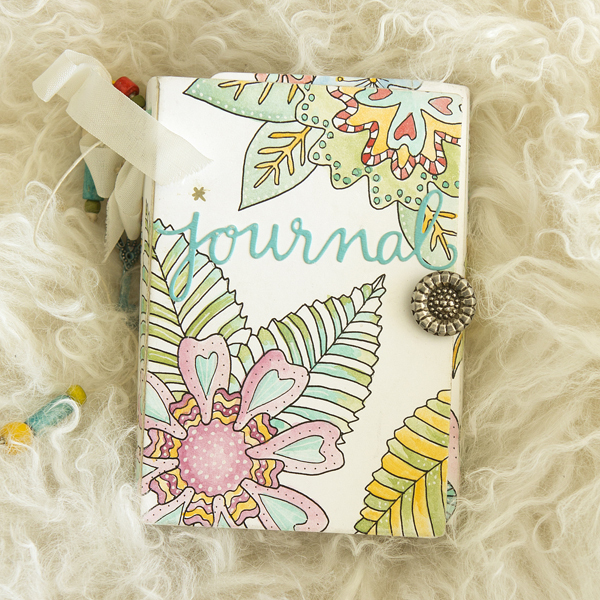 This is a relaxing way to create a gorgeous journal in your own style. You will go home with a completed doodled journal in your choice of colors. (The finished journal measures 5 1/8″ x 3 3/4″ x 1 3/4″. It’s chunky!) You will be inspired by all of the samples created by Eileen’s amazing Inspiration Team and get ideas for using the journal in so many other ways, so don’t forget your camera! What products will be highlighted: Sizzix dies, Clearsnap inks, and Sakura pens. What will I learn or complete: A finished and doodled Wrapped Journal. What do I need to bring to class: 12″ paper trimmer, non-stick mat, water brush or paintbrush, and baby wipes. What special supplies are needed to finish this project at home: Nothing. What techniques will I learn or use: You will learn how to use die-cut shapes as a base for doodling the journal cover, how to use Blends inks to color in the doodled design with a water brush, and how to assemble a Wrapped Journal and add inserts. Please visit Eileen’s website www.eileenhull.com for inspirational project ideas and to hear about her latest adventures. Visit her Etsy store to find unique dies and kits. Request to join the Eileen Hull Fan Club for exclusive Facebook Live events, giveaways, challenges and fellowship with over 3600 likeminded creators. Watch Eileen Hull Designs on Tuesdays and Thursdays for Facebook Live classes and events!